You'll want to start by installing all pre-bent and corner coping sections first with the self-tapping screws provided. During the installation process, make sure that the coping lip fits snugly against the face or top panel. Screws should be driven at 1 ft. intervals; a drill with a 5/16" hex head bit works best for driving these screws through the coping and into the pool panel. Tip: Every installation will require cutting your coping. Corner sections next to a step may have to be cut and hand-trimmed in order to fit snug to the step. Cutting the straight pieces of coping may be necessary when fitting them into place as well. While a hacksaw will cut through most aluminum extrusions, a miter saw outfitted with an aluminum cutting blade is recommended for the most professional results. After the corners are secured, screw the long lengths of coping in place in the same manner. 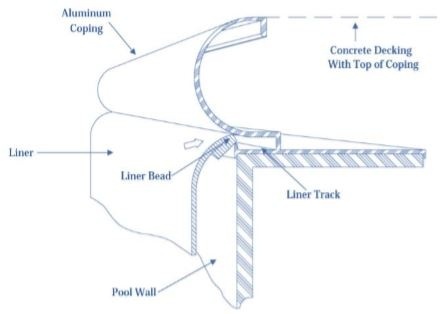 Make sure the liner receptacle on the lower edge of the coping is flush with the top inside edge of the pool walls. Included with the coping are 2" wide coping clips to use to cover coping joints. These clips must be placed before the concrete deck is poured. 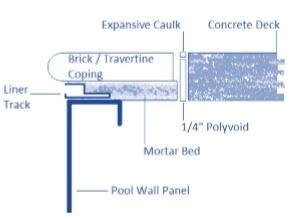 The coping provided with the pool has a dual purpose of acting as a receptacle (liner track) for retaining the liner bead as well as serving as an edge against which the concrete is poured. This image shows rounded bullnose coping. Flat-face bullnose coping comes in two styles. 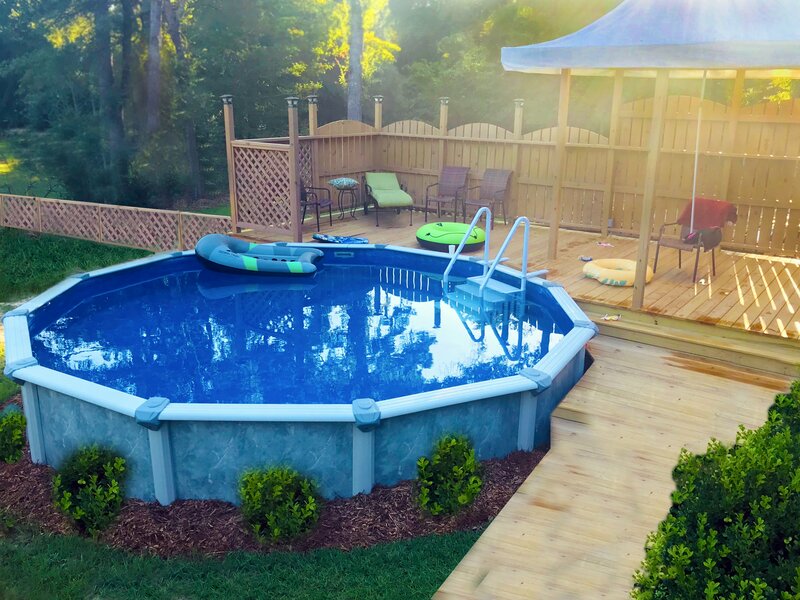 For flexible flat-faced coping (FCW or FCG), notice that these pieces are straight even for your corners as these bend to fit the desired radius of your pools form, hence “flexible” foam forms. These will also come with tethers which are typically placed where joints connect in order to stabilize the coping however they can be place anywhere needing additional stabilization. If using cantilever/flat track coping use the notched pieces (or pre-bent pieces) to bend around the radius or radius corner. The screws should be fastened every 12” (as a rule of thumb). It is important to have the track flush with each added piece of coping added. After the corners are secured, screw the long lengths of coping in place in the same manner. Make sure the liner receptacle on the lower edge of the coping is flush with the top inside edge of the pool walls. The track holds your liner in place. If using bricks, stone, travertine, etc. see the above diagram for an example of a commonly constructed deck design. Due to the fragile nature of foam forms, we send additional pieces with your order. Trimming the edges of each piece may be required. 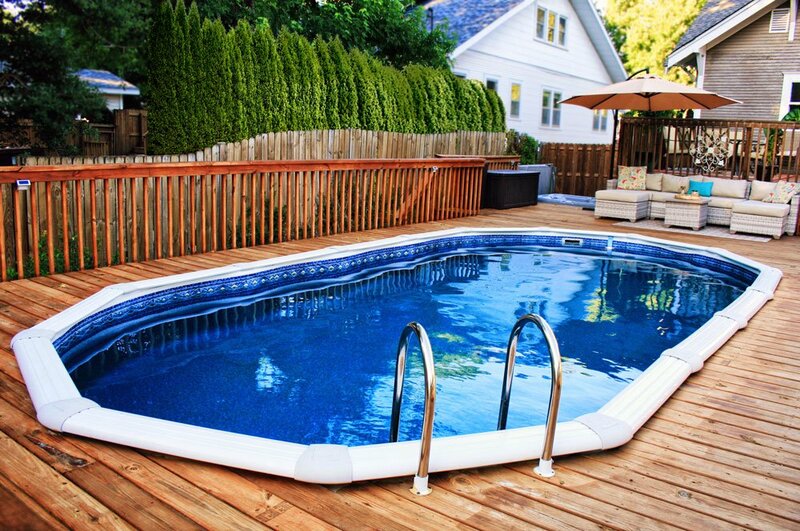 Once all other steps are complete and you are ready to prepare the bottom of your pool, (without your liner installed yet), peel the paper from the double-faced tape and stick the form to the panel with the form bead and plastic clips filling the liner opening. This form bead keeps the liner clean during the pour. The plastic clips snap into the track locking the form in place every six inches. When attaching the form to the panel, be sure to use the palm of your hand making sure that the tape bonds well.